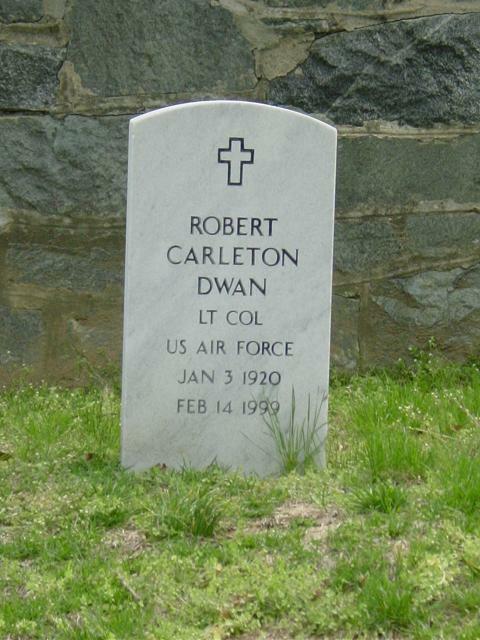 Robert C. Dwan, 79, a retired Air Force lieutenant colonel who later worked in financial investments in Washington, died of cancer February 14, 1999 at his home in Falls Church. Colonel Dwan was born in Eau Claire, Michigan, and attended Bowling Green University. He began his military career during World War II, serving as an Army Air Forces fighter pilot in the Pacific. His postwar career included service as a pilot of jet fighter aircraft. He retired from the Air Force in 1963 as commanding officer of a consolidated maintenance squadron at Paine Field, Washington. On his military retirement, Colonel Dwan settled in the Washington area and went into the investments business. He was vice president of Bellamah Neuhauser & Barrett Inc. He was a former president of the Homeowners Association of Idylwood Towers Condominium in Falls Church. His marriage to Janie Dwan ended in divorce. Survivors include his wife, Ruby Dwan of Falls Church; a son from his first marriage, Terry Dwan of Arlington; three stepchildren, Bill Nicol of Atlanta, Bob Nicol of Kimberline City, Mo., and Mary Nicol Lucas of Fairfax; six sisters; a brother; and two grandchildren. Cemetery. Memorial contributions may be made to Hospice of Northern Virginia.